As a counterpoint to the image of James Bowie presented in the Sir! article, in which he comes across as something of a madman, I am posting his report of the expedition he led into Indian territory in November 1831 and the Indian fight that resulted. Rezin Bowie, who participated in the adventure, wrote an account that was widely published, but James Bowie's report, which differs little in substance, is less well known and is not available on the internet, even through Google Books. I transcribed it from History of Texas (1893), by John Henry Brown. It is remarkable partly in that it is one of the few documents we have in Bowie's own words. It is clear from the quality of his writing as well as the content of the report that Bowie was an intelligent man, a capable military leader, and not inclined to highlight his own deeds. SAN ANTONIO DE BEXAR, Dec. 10, 1831. Agreeably to your lordship's request, I have the honor to report to you the result of my expedition from San Antonio to the San Saba. Information received through different channels in relation to that section of the country, formerly occupied by Mexican citizens, and now in the hands of several hostile Indian tribes, induced me to get up that expedition, expecting that some benefit might result therefrom both to the community and myself. But, as my intentions were known to you and approved by your lordship previous to my departure, I deem it useless to enter into these particulars. I left this city on the 2d of November last in company with my brother, Rezin P. Bowie, eight men and a boy. Wishing, with due care, to examine the nature of the country, my progress was quite slow. On the 19th we met two Comanches and one Mexican captive (the last acting as an interpreter) at about seven miles northwest of the Llano River, on the road known as de la Bandera. The Indians, after having asked several questions in regard to the feelings of the Mexicans towards the Comanches, and receiving an assurance on my part that they were kindly disposed towards all peaceable Indians, told me that their friends were driving to San Antonio several horses that had been stolen at Goliad. I promised them that they would be protected, and they continued on their way to the city to deliver the said horses to their proper owners or to the civil authority. On the following day at sunrise, we were overtaken by the captive, who informed us that 124 Tehuacanas were on our trail, and at the same time showing us the medal received this year by his captain from the authority of this city, which was sent to us to prove that the messenger was reliable. We were then apprised that the Tehuacanas had the day before visited the camping ground of the Comanches, and told them that they were following us to kill us at any cost. Ysayune (such was the name or the Comanche captain), having become informed of the determination of the savages respecting us, tried first to induce them to desist from the prosecution of their intention, insisting that they should not take our lives, and telling them he would be mad with them if they went to attack us, but they separated, dissatisfied with each other. Ysayune sent us word that if we would come back he would do all he could to assist us, but that be had only sixteen men under his command, and thought that we could defend ourselves against the enemy by taking a position on a hill covered by underbrush, which the captive was ordered to show us, adding, that the houses on the San Saba were close by. The houses alluded to were the remains of those belonging to the San Saba mission, that had been long abandoned. We did not follow the Comanche's advice, thinking that we could reach our destination, as we did, before the enemy could overtake us. But once arrived we could not find the houses, and the ground upon the San Saba offering no position for our protection, we went about three miles to the north of the river, and there selected a grove wherein to encamp for the night. There was a smaller grove about fifty varas [A vara is a Spanish unit of measurement. In Texas, it was defined as thirty-three and a third inches] from the one chosen for our encampment, and I caused it to be occupied by three men, so as to prevent the enemy from taking possession of it, and thereby have an advantage over us. However, we passed the night without being disturbed. On the 21st, at eight o'clock a. m., we were about to leave our camping ground, when we saw a large body of Indians close upon us, and at a distance of about two hundred varas. Several of them shouted in English: "How do you do? How are you? How are you?" We soon knew by their skins that they had among them some Caddoes, and we made signs to them to send us a man to inform us of their intentions. Just then we saw that the Indian, who was ahead on horseback, was holding up a scalp, and forthwith a volley of some ten or twelve gun-shots was discharged into our camp, but without effect. At the arrival of the Indians, my brother repaired with two men to the smaller grove which was between us and the Indians, but when I saw that most of them were withdrawing and sheltering themselves behind a hill about 100 varas northeast of our position, expecting, that they would attack us in a body from that direction, I went to tell my brother to come back and on our return Mr. Buchanan was shot and had his leg broken. We bad scarcely joined our camp when, as I expected, the Indians came from behind the hill to dislodge us, but as the foremost men, and among them the one who seemed to be the leader, fell, they busied themselves in removing their dead, and to do this they had to come closer and fight sharply, but it was at the cost of more lives on their part. This contest lasted about fifteen minutes; but when they perceived that they could not enter our camp they withdrew, screening themselves behind a hill and surrounding timber, and thence commenced firing upon us from every direction. While we were thus engaged, fifteen Indians, who, from the report of their firing, seemed to be armed with rifles, concealed themselves behind some oaks in a valley about sixty varas to the northwest. These were the severest of our foemen, and they wounded two more of our men and several horses. At about 11 o'clock, a. m., seeing, that they could not dislodge us with their fire-arms, they set fire to the prairie, hoping thus to burn us or compel us to abandon our camp. So soon as the prairie was on fire they loudly shouted, and, expecting their stratagem would be successful, they advanced under protection of the smoke to the position they had first been obliged to abandon; but when the fire reached the valley it died out. Thinking the siege would be protracted, we employed Gonzales and the boy Charles in making a breastwork of whatever they could lay their hands upon, such as boughs and our property. From that moment until 4 o'clock the fire slackened gradually, and the Indians withdrew to a considerable distance. But the wind having shifted from the southwest to the northwest, the Indians again fired the prairie, and the conflagration reached our camp, but by dint of hard work in the way of tearing the grass, and by means of our bear skins and blankets, made use of to smother the flames, we succeeded in saving the greater part of our animals and other property. We expected a furious attack of the enemy under cover of the smoke, in order to penetrate our camp, but the greater part of them withdrew to a pond, distant about half a mile from the battle field, to procure water, and those of them that remained kept up firing and removing their dead. This work on their part went on until about 6:30 o'clock p. m., when the battle closed, only one shot being fired by them after 7 o'clock, which was aimed at one of our men who went to obtain water. We had agreed to attack the enemy while they were asleep, but when we reflected that we had only six men able to use their arms, and that the wounded would have to remain unprotected, we thought it more advisable to remain in our camp, which we had now fortified with stones and timber, so as to make it quite secure against further assault. On the 22d, at about 5 o'clock a. m., we heard the Indians moving, towards the northeast, and at day-break none were to be seen. However, about 11 o'clock we observed thirteen of them, who, upon seeing us, withdrew suddenly. Subsequently, in order to intimidate them and impress them with the idea that we were still ready for a fight, we hoisted a flag on a long pole, as a sign of war; and for eight days we kept a fire constantly burning, hoping thereby to attract the attention of any friendly Comanches that might be in the neighborhood, and procure some animals for the transportation of our wounded and our camp property. 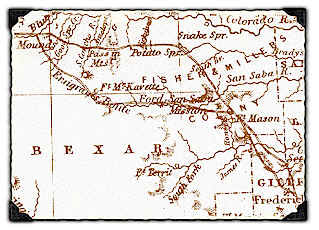 On the evening of the 29th, the wounded being somewhat relieved, we began our march for Bexar, and on striking the Pierdenales we observed a large Tehuacana trail, and noticed several others between that stream and the Guadalupe, all seeming to tend in the direction of a smoke that curled upward from some point down the Pierdenales. Upon seeing these trails, we took a more westerly course, and after having crossed the Guadalupe, we saw no more signs of Indians, and arrived here on the night of the 6th inst. My only loss among my men during the battle, was by the fall and death of the foreman of my mechanics, Mr. Thomas McCaslin, from a bullet that entered below the breast and passed through the loin. He was one of the most efficient of my comrades in the fight. I had, also, three men wounded, five animals killed and several severely hurt. We could make no estimate of the loss of the enemy, but we kept up a continual firing during the day and always had enemies to aim at, and there were no intervening obstacles to prevent our shot from having their full effect. We saw twenty-one men fall dead, and among them seven on horseback, who seemed to act as chiefs, one of whom was very conspicuous by reason of the buffalo horns and other finery about his head. To his death I attribute the discouragement of his followers. I cannot do less than commend to your lordship for their alacrity in obeying and executing my orders with spirit and firmness all those who accompanied me. Their names are Robert Armstrong, Rezin P. Bowie, Mathew Doyle, Thomas McCaslin (killed), Daniel Buchanan (wounded), James Corvell, Mateo Dias, Cephas K. Ham, Jesse Wallace, Senor Gonzales, Charles (a boy). Amazing. He was intelligent and that letter proves he was not a braggart like some believe because of a Mexican soldier's bogus, biased description as "Bowie the perverted braggart". Bowie detailed the entire San Saba Indian victory without one hint of arrogantly highlighting himself.